Palestinian uprising refers to a series of violent incidents between Palestinians and Israelis between 1987 and approximately 1990. The growing sense of frustration among Palestinians, particularly on the West Bank and in Gaza, at the lack of progress in finding a durable resolution for their humanitarian and nationalistic claims after the establishment of Israel in 1948 and the Six-Day War in 1967. The Palestine Liberation Organization had failed to make any significant headway against Israel since the 1960s, and had in 1982 been forced to establish its offices in Tunis. On December 8th 1987, when four Palestinian refugees from the Jabalya camp were killed in a traffic accident in Gaza the following day, rioting broke out in Jabalya. An 18-year old Palestinian was killed by Israeli soldiers during these riots after throwing a single stone, sparking further riots. Palestinians and their supporters assert that the Intifada was a protest of Israel's brutal repression which included extra-judicial killings, mass detentions, house demolitions, indiscriminate torture, deportations, and so on. In addition to the political and national sentiment, further causes to the Intifada can be seen in the Egyptian withdrawal from their claims to the Gaza Strip as well as the Jordanian monarchy growing weary of supporting Jordanian claims to the West Bank. Rapid rates of birth and the limited allocation of land to new building or agriculture amidst increasing Zionist settlement under the Israeli rule contributed to the increasing density of population in the Palestinian territories. Unemployment was growing, and while income from service labor in Israel allowed Palestinians to provide university education for their children, few jobs were available for the graduates afterwards. Others point out that Palestinians felt abandoned by their Arab allies and the PLO had failed to successfully challenge Israel and establish a Palestinian state. Considering all of the above and the mass scale of the uprising, it is of little doubt that it was not initiated by any single person or organization. However, the PLO was very quick to take matters into its hands, sponsoring provocateurs and enhancing their presence in the territories. The PLO was not uncontested, however, competing in its activities for the first time with Islamic organizations - Hamas and Palestinian Islamic Jihad. And most importantly, the uprising was predominantly led not by any of these groups, but by community councils consisting of ordinary Palestinians creating autonomous structures and networks in the midst of Israeli occupation. These councils, though they mainly engaged in armed resistance, also focused on creating independent, often-underground infrastructure, such as autonomous schools, medical care, food aid and other basic institutions. On October 1, 1986 Israeli military ambushed and killed seven men from Gaza believed to be members of the Palestinian Islamic Jihad group. Several days later an Israeli settler shot a Palestinian schoolgirl in the back. On December 4, 1986 Shlomo Sakal, an Israeli plastics salesman, was stabbed to death in Gaza. On December 8, there was a traffic accident in which an Israel Defense Force truck crashed into a van, killing 4 Palestinians from Jabalya. Under these already heated circumstances, many rumors began to spread. The mere presence of stories, reinforced by the real incidents above, caused anger and street fights against Israeli policemen and soldiers. On December 8, 1987, an uprising began in Jabalya where hundreds burned tires and attacked the Israel Defense Forces stationed there. The uprising spread to other Palestinian refugee camps and eventually to Jerusalem, the eastern part of which was and is occupied by Israel. On December 22, the United Nations Security Council condemned Israel for violating Geneva Conventions due to the number of Palestinian deaths in these first few weeks of the Intifada. Much of the Palestinian violence was low-tech; dozens of Palestinian teenagers would confront patrols of Israeli soldiers, showering them with rocks. However, at times this tactic gave way to Molotov cocktail attacks, over 100 hand grenade attacks and more than 500 attacks with guns or explosives. Many Israeli soldiers were killed this way. The IDF, in contrast, possessed the latest weaponry and defense technologies. In 1988, the Palestinians initiated a nonviolent movement to withhold taxes collected and used by Israel to pay for the occupation of territories. When time in prison didn't stop the activists, Israel crushed the boycott by imposing heavy fines while seizing and disposing of the equipment, furnishings, and goods from local stores, factories, and even homes. On April 19, 1988, a leader of the PLO, Abu Jihad, was assassinated in Tunis. During the resurgence of rioting that followed, about 16 Palestinians were killed. In November of the same year and October of the next, the United Nations General Assembly passed resolutions condemning Israel. As the Intifada progressed, Israel introduced various riot control methods that had the effect of reducing the number of Palestinian fatalities. Another contributor to the high initial casualties was Yitzhak Rabin's aggressive stance towards the Palestinians (notably including an exhortation to the IDF to "break the bones" of the demonstrators). His successor Moshe Arens subsequently proved to have a better understanding of pacification, which perhaps reflects in the lower casualty rates for the following years. Attempts at the peace process in the Israeli-Palestinian conflict were made at the Madrid Conference of 1991. By the time the Oslo Accords were signed in 1993, 1,162 Palestinians (241 of them children) and 160 Israelis (5 of them children) had died . This initially high fatality rate on the Palestinian side was due largely to the Israel Defense Force's inexperience in pacification and crowd control. Often when facing demonstrators IDF soldiers had no riot control munitions, and would shoot unarmed demonstrators with live fire. The Palestinian fatalities include many killed by their own side as collaborators. The Intifada was never a military endeavour in either a conventional or guerrilla sense. The PLO never expected the uprising to make any direct gains against the Israeli state, as it was a grassroots, mass movement and not their venture. However, the Intifada did produce a number of results the Palestinians considered positive. By engaging the Israelis directly, rather than relying on the authority or the assistance of neighbouring Arab states, the Palestinians were able to globally cement their identity as a separate nation worthy of self-determination. The era marked the end of the Israelis referring to Palestinians as "South Syrians" and largely ended Israeli discussion of a "Jordanian solution". The harsh Israeli countermeasures resulted in international attention returning to the plight of the Palestinians, as prisoners in their own land. The fact that 159 Palestinian children below the age of 16 were killed was especially alarming for international observers. The conflict succeeded in putting the Palestinian question back on the international agenda, particularly in the UN, but also for Europe and the United States as well as the Arab states. Europe became an important economic contributor towards the nascent Palestinian Authority. The intifada also dealt a heavy economic blow to Israel. The Bank of Israel estimated it cost the country $650 million in lost exports, largely through successful Palestinian boycotts and the creation of local microindustries. The impact on the services sector, including the important Israeli tourist industry, was notably bad. The uprising can be linked to the Madrid Conference of 1991. Although the negotiations failed to fulfill their potential, it is notable that prior to the first Intifada, it was doubtful whether there would ever be a Palestinian state. After the Oslo accords, an independent Palestine of some sort, at some time in the future seemed relatively certain. The first Intifada began in a piecemeal fashion with demonstrations and civil disobedience. The first Intifada began in a piecemeal fashion with demonstrations and civil disobedience sparked by an increasing number of shootings and human rights abuses by the Israeli occupation. The grassroots protests of 1987 escalated into full-blown riots involving much of civil society, from organisations, union groups to newly created institutions to the ordinary population who came out in large numbers on to the streets led by rock-throwing youths. As the protest movement developed, more sophisticated missiles, such as the Molotov cocktail, were used and occasional operations by resistance fighters against the Israeli occupation forces and its installations were carried out. Israel reacted by killing and deporting Palestinian residents, closing universities and making mass arrests. By December 1987 a full-scale uprising had broken out in the Gaza Strip. It continued for five years. The Intifada (or popular uprising) marked a new era in mass resistance in Palestine, signalling an end to years of passivity. Lacking the necessary arms to face the Israeli military, people in the occupied territories invented their own ways of fighting back. Many young men took to wearing masks and ambushing the Israeli army with a rain of stones. One interesting mode of asserting independence was when Palestinians rejected Israel's daylight-saving time and worked to their own clock. Initially the Intifada was led by the Unified National Command, a loose grouping of Palestinian Liberation Organisation (PLO) bodies. Later, the PLO incorporated with the command to take credit for leading the Intifada. Hamas (the Islamic Resistance Movement) defied the secular national movement, especially in Gaza, and sought to take over the leadership of the Intifada. It saw the new developments as a deliberate relinquishment of the rights of the Palestinian people. Hamas continued to carry out field operations against the Israeli forces, insisting that armed resistance was the only way to win back Palestinian rights. The Intifada developed more sophisticated tactics. The military operations and stone-throwing were backed by a network of well organised strikes, the boycotting of Israeli goods, closures and demonstrations. The refugee camps became major centres for action. The goals of the Intifada won broad sympathy from the governments and people of Arab and Muslim countries, while Arabs in Israel took the side of their blood brothers. They considered the Intifada to be a rebirth of the 1976 uprising, later known as the “day of the land”, which saw demonstrations and strikes in protest against the confiscation of Arab land for use by Jewish settlers in the north of Israel. In June 1988, a new way of resistance to back the stone-throwers was adopted. Palestinian resistance fighters set fire to 500 Israeli interests over a 27-day period. Israel had demanded the international community put pressure on the Intifada leaders to give up armed resistance. Yet, in July 1988 the Israeli authorities did not prevent a group of Jewish extremists from digging a new tunnel between the two Islamic holy sites in Jerusalem, al-Buraq Wall and the al-Aqsa mosque. Muslim clerics, through mosque loudspeakers, appealed to the people to defend their holy sites. Muslim Arab Palestinians rushed to stop the digging. The Israeli police forces were brought in leading to bloody clashes in and around al-Aqsa. Later, fighting spread throughout Palestine. There were dozens of Palestinian casualties. A state of emergency was declared, and Palestinian cities, towns and villages were put under siege. Schools and universities were closed. 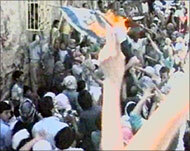 The Intifada carried on throughout the early 1990s. On 9 October 1990 Israeli forces killed 19 Palestinians in clashes with stone-throwers, and in December 1992, 413 Palestinians were deported to the inhospitable borders with Lebanon. As the first Gulf war was underway in 1991, Iraq ceased to be a major power in the Middle East. The Palestinians felt that they had lost a substantial backer, and this resulted in rapid developments in the Arab-Israeli conflict. The peace process, started in Madrid in 1991, led to secret negotiations in Oslo, Norway, and by 1993 Arafat recognised Israel’s right to exist and signed a peace agreement. In 1994, the Palestinians were given limited autonomy in parts of the occupied Palestinian territories. By that time, tension began to ease and the popular uprising petered out, amid high hopes for a better future. According to the Israeli Information Centre for Human Rights in the Occupied Territories, BTselem, 1124 Palestinians lost their lives in the first Intifada. Some 16,000 were imprisoned and many were routinely tortured. Fewer than 50 Israeli civilians were killed. The first intifada (the Intifada, from the Arabic for “shaking off ”) was a popular uprising among Palestinians against Israel’s military occupation, confiscation of their land, and suppression of their collective identity. The uprising started on December 8, 1987, in the Palestinian refugee camp Jabalya in the Gaza Strip, and quickly spread to the rest of Gaza and the West Bank, including East Jerusalem, all of which had been under Israeli occupation since the 1967 Arab-Israeli War. 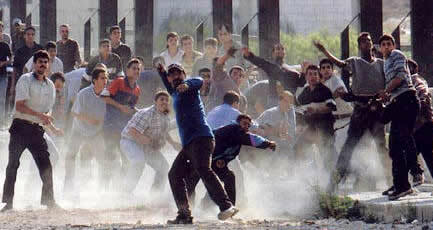 The Intifada was a spontaneous popular phenomenon caused by a number of domestic and international factors. The most important of these factors was a sense of hopelessness that had pervaded the occupied territories and the belief among Palestinians that neither the military efforts of the Arab states nor diplomatic efforts by the Palestine Liberation Organization (PLO) and Arab states would end the occupation. According to some analysts, the final catalyzing factor emerged in November 1987 when the Arab leaders at the Summit Conference in Amman, Jordan—just 40 miles away from the occupied territories—placed the Iran-Iraq War at the top of the Arab political agenda and relegated the Palestinian question to the end of the list. In addition, the Palestinian economy had declined since the 1967 war, and the territories had become a reservoir for cheap labor for Israel and its second-biggest export market after the United States. The average income of the Palestinian worker had declined, and a growing number of Jewish settlers had moved into the territories. Following high casualties among Palestinians, the United Nations Security Council announced that it deplored the Israeli repression, but the confrontation continued and in the first 13 months of the Intifada more than 300 Palestinians and 12 Israelis lost their lives. The economic price of the Intifada was also high. Between 1987 and 1990 the GNP in Gaza declined at least 30 percent; the situation in the West Bank was not much better. By the middle of 1990 the Intifada had lost much of its earlier impetus, and popular frustrations resulted in the killing of real or suspected collaborators. In spite of these hardships and the lack of success, the Intifada was seen by the Palestinians as a major event in their recent history. It was a popular action that encompassed all social strata and groups. The popular committees in towns and villages mobilized the population and looked after the families of the dead and wounded. 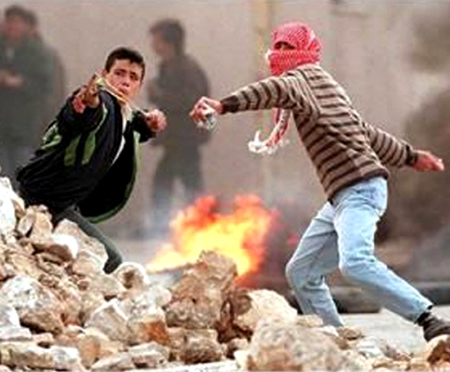 However, the Intifada failed to achieve the long-term goal of self-determination and the end of the Israeli occupation. In November 1988 the Palestinian National Council at Algiers declared an independent Palestinian state, but Israel deemed the declaration null and void. Although the PLO did not initiate the Intifada, it tried to play a leading role in the struggle, in the course of which the PLO and Hamas became political rivals. This internal division weakened the popular movement. The Intifada did succeed in bringing international attention back to the Palestinian cause and was a factor behind the U.S. sponsorship of the Madrid Conference in November 1991.